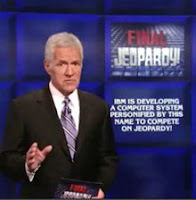 Today a game show, tomorrow the world - How IBM Plans to Win Jeopardy! IBM's Watson will showcase the latest tricks in natural-language processing. For decades, humans have struggled to create machines that can extract meaning from human language, with all its messiness, subtle context, humor, and irony. Traditional approaches require a great deal of manual work up front to render material understandable to computer algorithms. The ultimate goal is to make this step unnecessary. IBM hopes to advance toward this objective with Watson, a computer system that will play Jeopardy!, the popular TV trivia game show, against human contestants. Demonstrations of the system are expected this year, with a final televised matchup--complete with hosting by the show's Alex Trebek--sometime next year. Questions will be spoken aloud by Trebek but fed into the machine in text format during the show. The company has not yet published any research papers describing how its system will tackle Jeopardy!-style questions. But David Ferrucci, the IBM computer scientist leading the effort, explains that the system breaks a question into pieces, searches its own databases for "related knowledge," and then finally makes connections to assemble a result. Watson is not designed to search the Web, and IBM's end goal is a system that it can sell to its corporate customers who need to make large quantities of information more accessible.